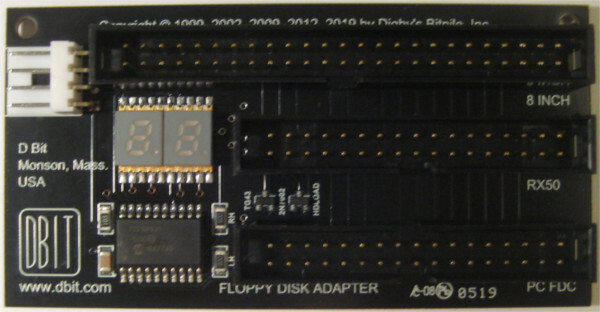 The D Bit FDADAP board is a small adapter which adapts 8" floppy disk drives (Shugart SA800 style bus) to work with the PC 3.5"/5.25" floppy disk cable pinout. It has 34- and 50-pin connectors which can be connected to the PC floppy controller and the 8" disk drive using simple straight-through ribbon cables (not included), and a 3.5" style power connector for the on-board microcontroller. It also includes a second 34-pin connector for use with real DEC RX50 drives; this configuration is not yet supported by current releases of D Bit software (which use a regular PC 1.2 MB drive for accessing RX50 disks), but support is planned for future versions. Some 8" floppy disk drives require a "TG43" signal, which tells the drive whether its head carriage is currently positioned at a track number greater than 43 (in which case the drive should use reduced write current). This signal is not normally provided by PC FDCs, so the FDADAP board has a microcontroller which monitors the disk bus and keeps track of the signals related to seeks, so that it knows which track each drive is positioned on, and transparently generates the correct TG43 signal for the currently selected drive with no intervention from host software. The on-board CPU also combines the per-drive "motor on" signals from the PC controller into the common signal used in the RX50 and 8" drive busses, and in current versions (since 2009), displays the selected drive's current track number on small 7-segment LEDs. It should be noted that the FDADAP board adapts the floppy control signals, but not the data signals, which are passed straight through. This means the board will not affect the host controller's ability (or lack thereof) to access 8" single density disks (IBM 3740 / CP/M SS SD / DEC RX01 format). Some controllers can (such as those based on the National Semiconductor PC8477B, or the SMC and Goldstar 37C65 chips), and many can't. In some cases however, controllers that can't write single density disks are still able to read them. IBM-style double density (77x26x256 System/34 format or most formats with similar encoding) will work on most FDCs, since they're close to the HD formats that the PC uses. However, DEC RX02 disks can't be accessed by normal PC style floppy controllers, because the low-level format is a strange combination of single and double density. Other non-IBM schemes, and hard-sectored disks, will also not work with a regular PC uPD765-compatible controller. Although the FDADAP will enable the PC hardware to control 8" drives, PC operating systems will not recognize 8" disks or alien file systems without additional software. In general it's up to the user to find (or write) programs that can read their disks, since there are too many possible formats for one program to handle them all. However, D Bit provides a couple of free DOS utilities which may be useful to some users. They must be run under plain DOS (e.g. FreeDOS), not in a Windows DOS box, since they need to be able to reprogram the PC's floppy disk hardware (which is virtualized in current versions of Windows). PUTR, a utility for reading/writing files on various DEC PDP-8 and PDP-11 disk formats. FDCDEMO, an FDC I/O demonstration program which can copy between an entire floppy and a single large .DSK file, after the user sets the disk parameters with keyboard commands. Extracting individual files from the .DSK file must be done with your own (or 3rd-party) software. Hans Liss has designed a nifty 3D-printable mounting bracket for the FDADAP.